Bring your friends down to mezza9 this September to enjoy a delicious journey into nine divine chocolate-based desserts. 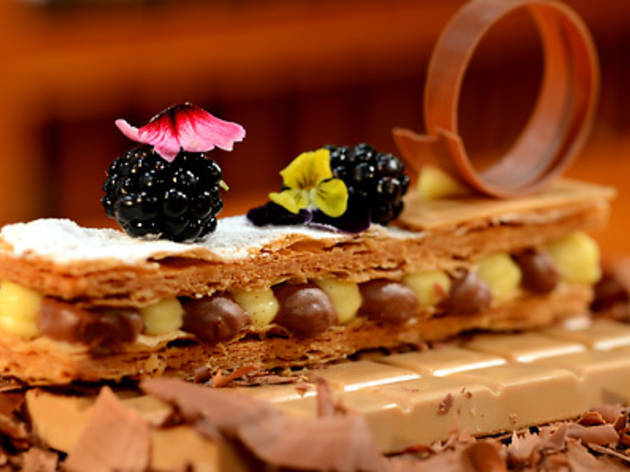 Prepared by the Grand Hyatt's pastry chef using the finest gourmet chocolate from six different countries such as Belgium, France and Switzerland, your inner Oompa Loompa will be beyond satisfied. Amongst our recommendations are the Bitter Chocolate Cream (below), which is served with olive oil, sea salt and crispy bread to culminate in a decadent mix of flavours, and the Cocoa Sherbet and Cocoa Tuile, which is served atop a theatrical dry-ice-filled glass. And don't let the fact that it's made from 100% cocoa paste scare you - we promise it's worth trying, and not as bitter as you think. 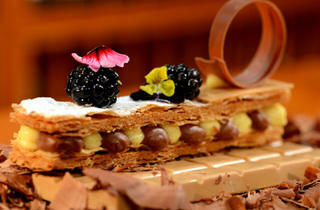 Another interesting treat is the Dulcey chocolate and caramel mille-feuille. This is the first time that the Dulcey 32% by Valrhona - the world's first 'blonde chocolate', which tastes lighter than other types of chocolate and possesses a biscuity, caramelish undertone - is available in Singapore. Other iterms on the menu include an ivory chocolate crème brûlée made with Lindt chocolate (below), hand-rolled truffles and a mini cup of rich hot chocolate. If you fancy indulging yourselves further, do pair your sweet treats with a glass of fine wine. The sommelier's personal favourite is the Brachetto D’Acqui from Italy, his native country, which cannot be found elsewhere in Singapore ($75/bottle; $20/glass). The chocolate set is recommended for two to three persons (though we think it can easily be shared between more people), and is available throughout mezza9's opening hours.